Do you enjoy personal space? Well tough luck, kid. It doesn’t exist during rush hour in Tokyo. On the Bay Area Rapid Transit (BART), when a train is a little full and there is a group of people trying to get on, someone from inside the train usually yells, “Train’s full!” People will then either walk down to the next car or wait for the next train to arrive. But not in Tokyo! There is always room for one more (or two, or ten). People just turn their backs to the door and board the train by backing their way in, literally. You have not fully experienced Japan until you have a tiny Japanese girl back that thang up into you to squeeze her way into the train. I am not exaggerating. She walked up the train, and as soon as the sliding doors opened, she turned around and proceeded to back that thang up into me like Cash Money Millionaire’s Juvenile. She didn’t gently squeeze in either. No. She backed into me like she was boxing me out trying to grab a rebound. I ended up being face to face with another man – so close that we might as well have been making out. All I could do at that point was grab onto one of the handrails as the train made its way to the next stop. Once we got to the next station, MORE people got on which pushed me in even further. I was literally sandwiched by four to five people as I held onto dear life while trying to maintain my balance. At one point, I kid you not, I was standing on one foot, leaning about 70 degrees backwards as I held onto the handrail with my back against the front side of my fellow commuter who somehow magically proceeded to play Candy Crush on his iPhone. I looked over to see Vic resting her head on some guy’s shoulder, with her eyes closed, trying to sneak a sleep. Luckily we were only one or two more stops away from our destination. I don’t remember. At some point I blacked out from the madness. Haha. When we arrived our station and people got off the train, it was like a breath of fresh air. You know the feeling you get when you let a good fart out? Yeah. It was like that. It was as if the train accumulated gas at each station, until it reached the end of the line where people got off and it just let it go. Let it goooooo. So be warned. The Japanese morning commute is not for the feint of heart. Our pictures don’t even do it justice. See this photo? Yes, it got more full after this, but I couldn’t even reach my phone after this photo was taken. 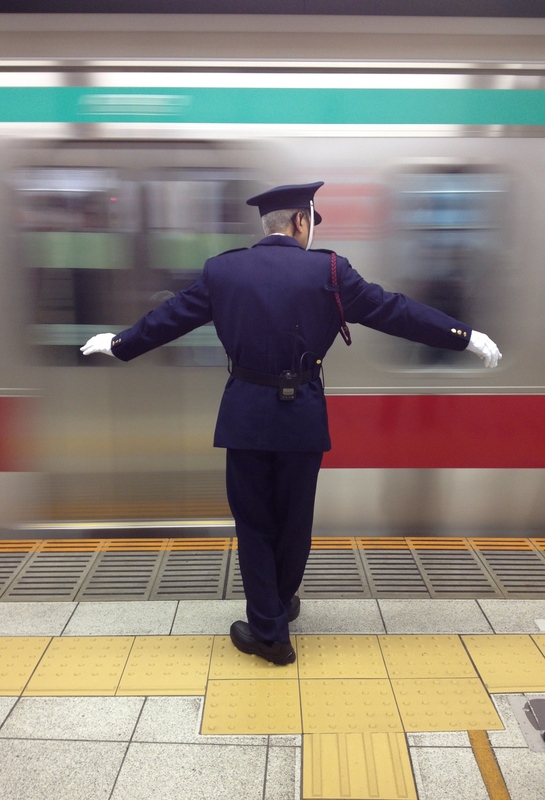 Train Officer: He ensures that the doors don’t get shut on any bags, jackets, arms, and legs.. His T-shaped stance also signifies it’s too late to board the train.